Extermination Angel from Maryland is extremely old school in presentation, composition and production. These six songs harken back to a time when men were men and metal was metal. The music and arrangements are purposefully somewhat simplistic, but there’s variation between grinding beats and plodding riffs and growled vocals and screams. They play death metal with a heavy black metal influence. These guys don’t take themselves too seriously, but as they wear gauntlets and dark sunglasses on stage, they’re not making it into a joke or an ironic approach. Basically they’re a barrel of death metal fun. And they feature a D.U. contributor on axe. 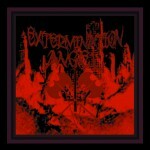 This entry was posted in Reviews and tagged death metal, Extermination Angel, Maryland by Editor. Bookmark the permalink.